I am linking up with Oh' Boy 4th Grade for Augusts Currently! I cannot believe it is AUGUST already! Where has the summer gone? I just got done with summer credits and a big energy class that was two weeks long. My two oldest are working hard to save for college so they are gone quite a bit and now my husband starts football next week. Did anyone else's summer go WAY TOO FAST? Now it is time to plan for the upcoming school year, finish up some TPT projects, and get my classroom ready, not to mention that school garden that is overflowing with veggies to pick. It sure is always fun to link up with Farley though! An outdoor science lesson sounds so fun! I hope you get to squeeze in some family time before school starts! 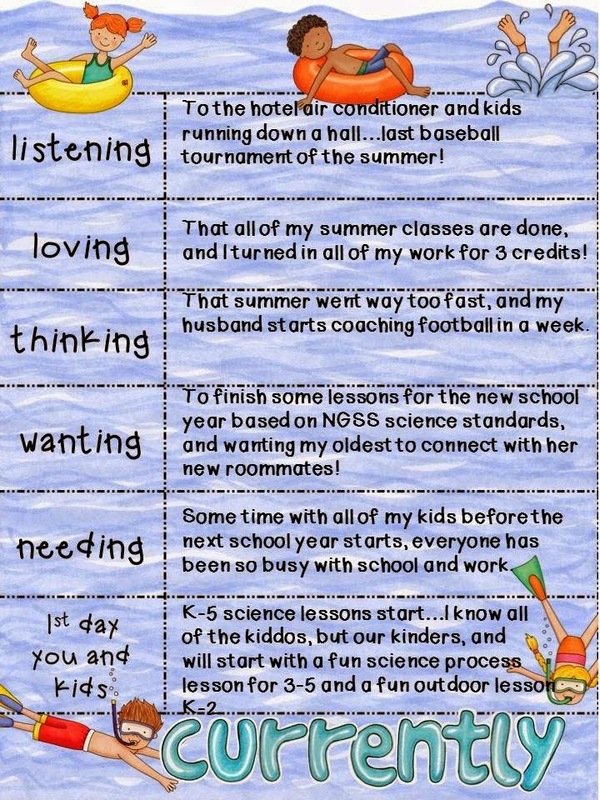 Oh, your post just reminded me- I teach science to 3rd-5th grades and I will know all the 4th and 5th graders already! The third graders are new to my school. Anyway, that is something to look forward to- means I will have less names to worry with. Not that I remember them anyway! Enjoy the beginning of your year!